But by the end of 2016, when I interviewed food instagrammers for the best cafes of the year, jellylovesfat picked Carol Mel Cafe. Curious, we made “a trip down just for this cafe”, incognito as of our usual practice. And when we visited the cafe on a Saturday at 3pm, it was full house. Mind you, full house in an industrial area on a weekend at 3pm. So what turned the cafe around? How did it rise out of the ashes? How did it defy predictions of failure and closure and become a successful and outstanding cafe against all odds? 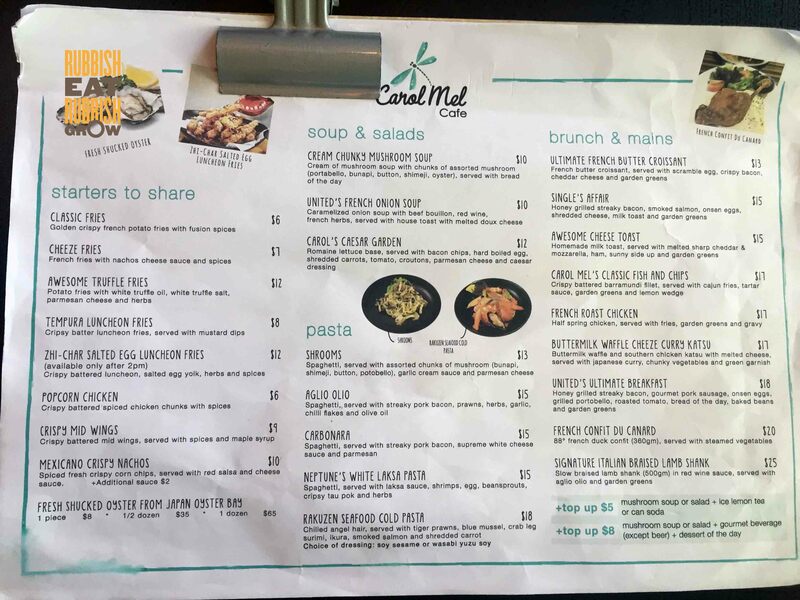 When sisters Carol and Mel–hence the pun on “caramel” cafe–first opened the cafe, they sold Ipoh beehoon for less than $10. But selling street food at twice as much as neighbouring kopitiams just won’t do. Slowly, they changed their menu to a Western one. For the mains, they said that the entire process of cleaning, brining, confitting the duck confit ($20) takes up almost two days. Next time we return, we’ll try the duck, but this time, the braised lamb shank ($25) hits all the right notes. It took a very, very time for the lamb to come, about 20 minutes. And it should be illegal to make hungry people wait for their food. But when it came, it was worth the wait. When we tore the meat, steam rose lazily; this is how food should be served. Steaming hot. The lamb (500g) comes in a delectable red wine sauce with a hint of pepper. But on its own, it is already very flavorful and tender. The aglio olio has the perfect al dente texture and is fragrant with a touch of chilli. Even the side salad is fresh and crunchy. 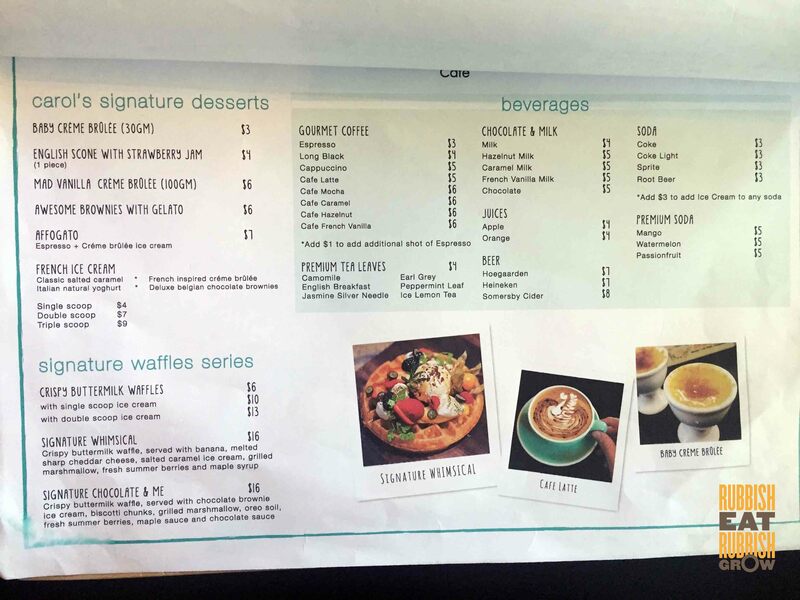 Their signature whimsical waffles ($16) is outstanding because of the toppings. The waffles itself is good: buttery, extremely crispy with a thin layer of fluffiness. But comparing waffles alone, I prefer Hatter Street Cafe‘s or Hang Out Cafe‘s. Carol Mel’s version is a bit too crispy for me; I prefer some degree of fluffiness. It is the toppings that make the waffles outstanding. There are all sorts of weird flavors going on, flavors that you wouldn’t think work together. A pungent cheddar cheese is melted on top of the banana; in the mix, there are sour berries, toasted melty marshmallows, salted caramel ice cream, two sprigs of PARSLEY; all of which are drizzled lightly with maple syrup. It sounds very, very weird. Savory, sweet, pungent, salty… but everything works fantastically together. When we ordered coffee, the server asked for our name. Mr Fitness turned to me and said, “Why did he ask for my name? Is this Starbucks?” Mystery solved when the coffee came: the barista wrote Mr Fitness’s name on the flat white. WAH, this is latte art level 999. The coffee, by the way, is not bad; it’s medium bodied and not bitter at all. Although it doesn’t have much character, it is likely to please most people. A word on the service: Outstanding. Cheerful, friendly chap who served us drinks (although it is self-service), and who took our orders (although we were supposed to order at the counter). To answer the questions posed in the beginning of how Carol Mel Cafe salted-fish-flip-body, (1) they took a heuristic approach, and are willing to change things when they don’t work, and they changed the ipoh street menu to a more expensive western food menu, so the average spending of a customer increases; (2) they put in a lot of heart. As you can see from the menu below, there is really nothing very special about the dishes. But they put in effort to perfect recipes and the dishes are cooked excellently; (3) fantastic service; (4) despite pleasing customers, they also retain their own personality. This must be the only cafe in Singapore to play 80s Cantonese songs. We paid $50 for two persons, including our coffees. Mr Fitness chatted with the server and said “Next time when we come back…” I guess there will be a next time and maybe another time after that. Carol Mel really is one of the more outstanding cafes in Singapore. Big thank you to jellylovesfat for this wonderful recommendation. Silk Road, Amara Hotel, Tanjong Pagar: Inner Mongolian Chef Presents Provincial Homemade Wheat Noodles and Dumplings From $8 to $14!